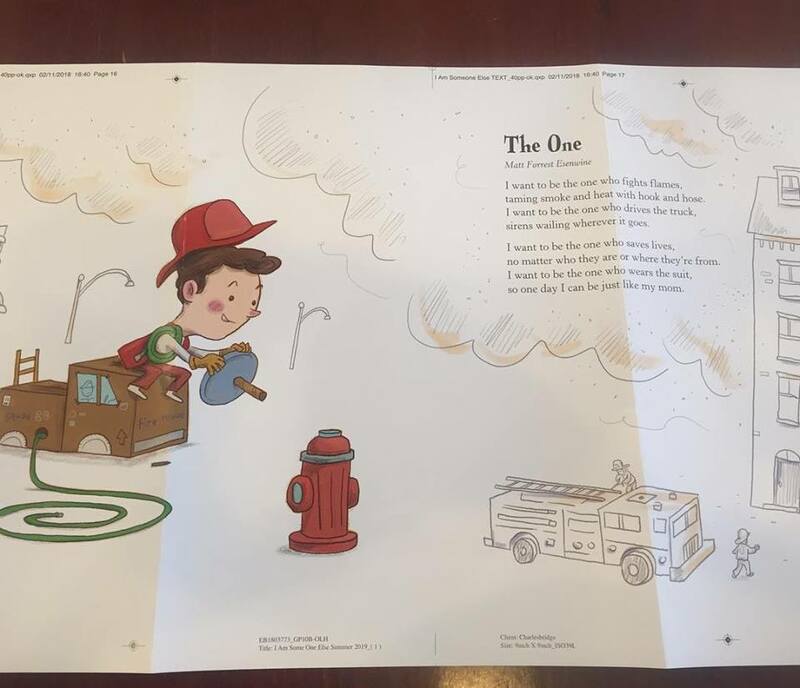 Poetry Friday: “I Am Someone Else” first peek! As we approach the end of 2018 – and as those of us who celebrated Christmas attempt to get our lives back into their normal rhythm – I thought I’d share a wonderful surprise gift I received just a few days before Christmas. 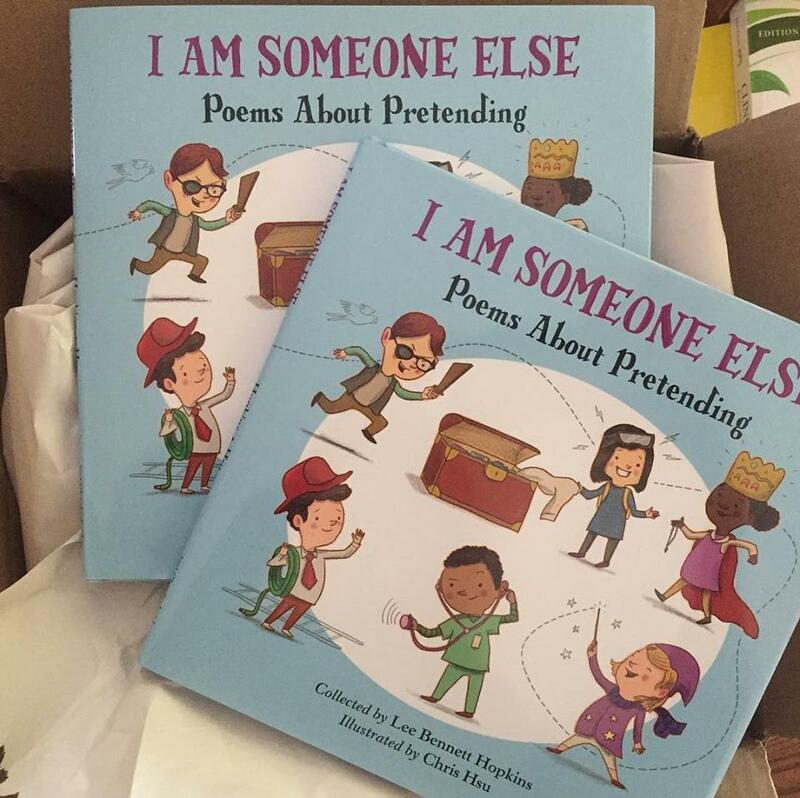 The proof of the spread of my poem in Lee Bennett Hopkins’ new upcoming children’s poetry anthology, I Am Someone Else: Poems About Pretending, arriving July 2, 2019 from Charlesbridge! Once again, I’m honored to be included in a collection that features so many talented, highly-esteemed writers as former U.S. Children’s Poet Laureate J. Patrick Lewis, Newbery winner Lois Lowry, and many others. By the way, the annual CYBILS Awards‘ Poetry category shortlist has been officially nailed down, and we’ll be sharing the results soon (Shortlisted titles move on the 2nd Round judges, who will decide the winners in February). 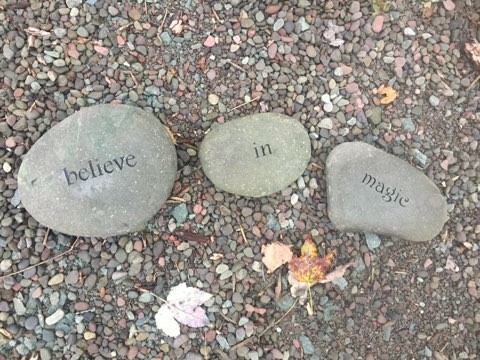 For more poetry, head on over to Mainely Write, where my friend Donna Smith has today’s complete Poetry Friday roundup! 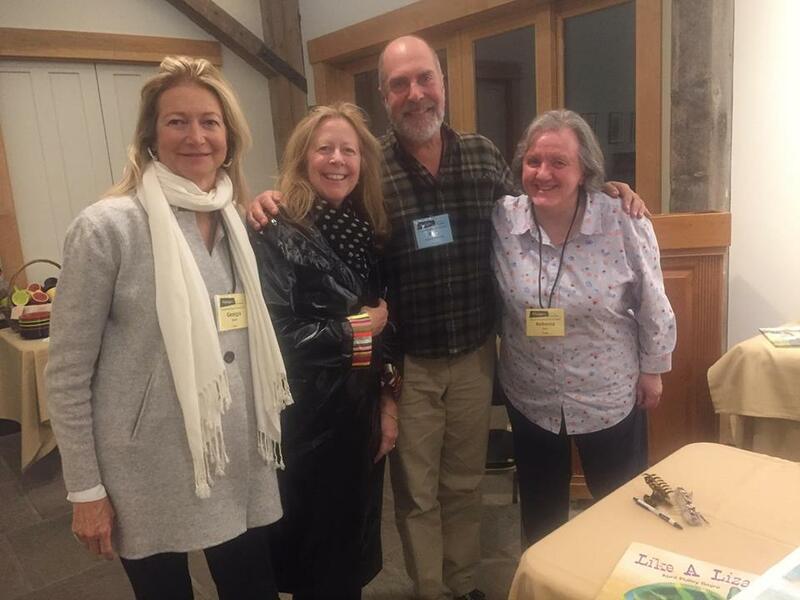 Two weeks ago, I spent 5 days living, breathing, and eating children’s poetry (and writing it, too, for that matter) at the Highlights Foundation’s “The Craft and Heart of Children’s Poetry” workshop in the tiny little town of Milanville, PA. I had previously attended a similar workshop with David L. Harrison back in 2013, and had been wanting to attend another ever since. It took me five years to return, but the wait was well worth it! In addition to Rebecca and Georgia, we were joined by Boyds Mills Press/Wordsong editor Rebecca Davis, who was my editor for Flashlight Night. Rebecca spoke to our group about poetry publishing and even offered some critiques. Also on hand was poet/author Carole Boston Weatherford, who offered insight into writing poetry in different voices, and Lee Bennett Hopkins, who chatted via Skype about his poetry anthologies and the state of children’s poetry in today’s market. My residence for 5 days. Couldn’t ask for anything coszier! Everything is included in your tuition: the workshop, room, meals, snacks…everything. 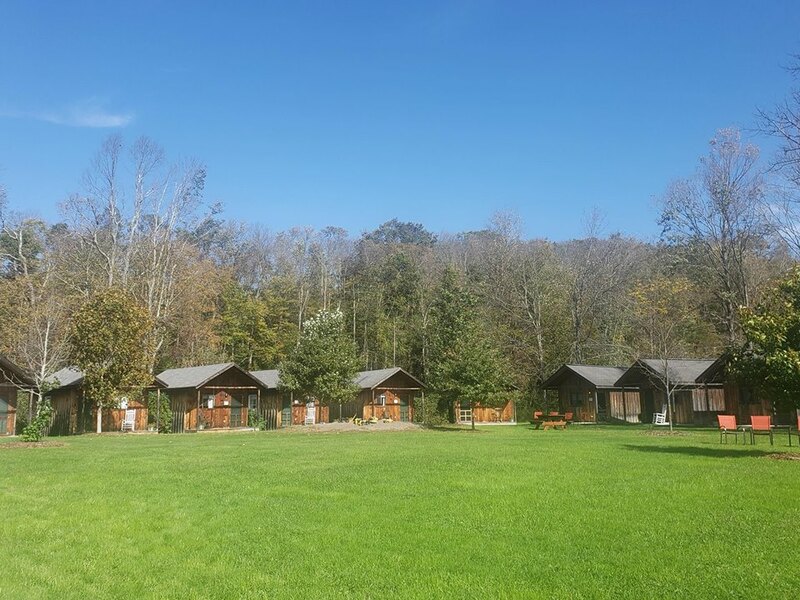 You might stay in one of the cabins, like I did, or they may put you up in the Lodge nearby. 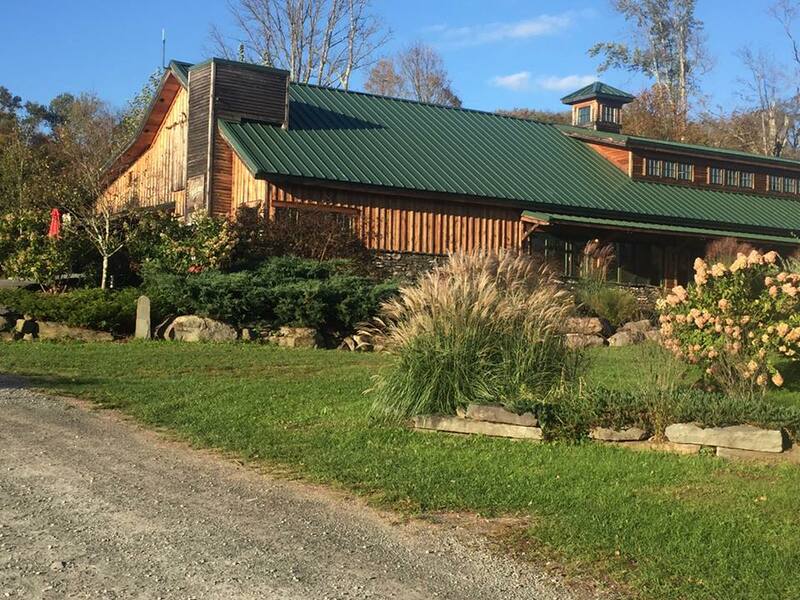 All of the workshops and meals are held inside The Barn, a large facility recently built when the old farmhouse next door, the former residence of Highlights for Children magazine’s creators Garry and Caroline Myers, became too small to handle all of the folks attending the plethora of workshops. Heck, there were almost 20 of us there, and they have workshops running throughout the year! Want to attend a session? Head to The Barn. Joining your friends for a meal? Head to The Barn. Need a computer or printer? Head to The Barn. Wake up at 2am and decide you’re in the mood for some ice cream, Doritos, and a cold beer? Yep…head to The Barn! They’ve got you covered. 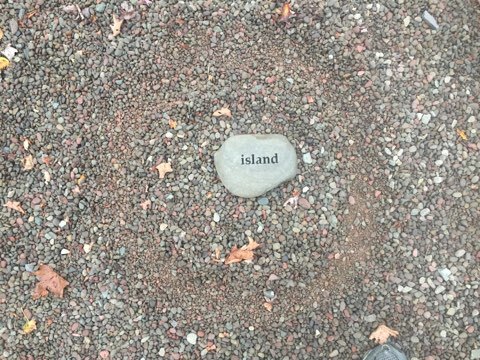 The Word Garden: You may have visited a rock garden before, but you’ve never been to this kind of rock garden…where stones are waiting in piles for you to dream up poetry with them! 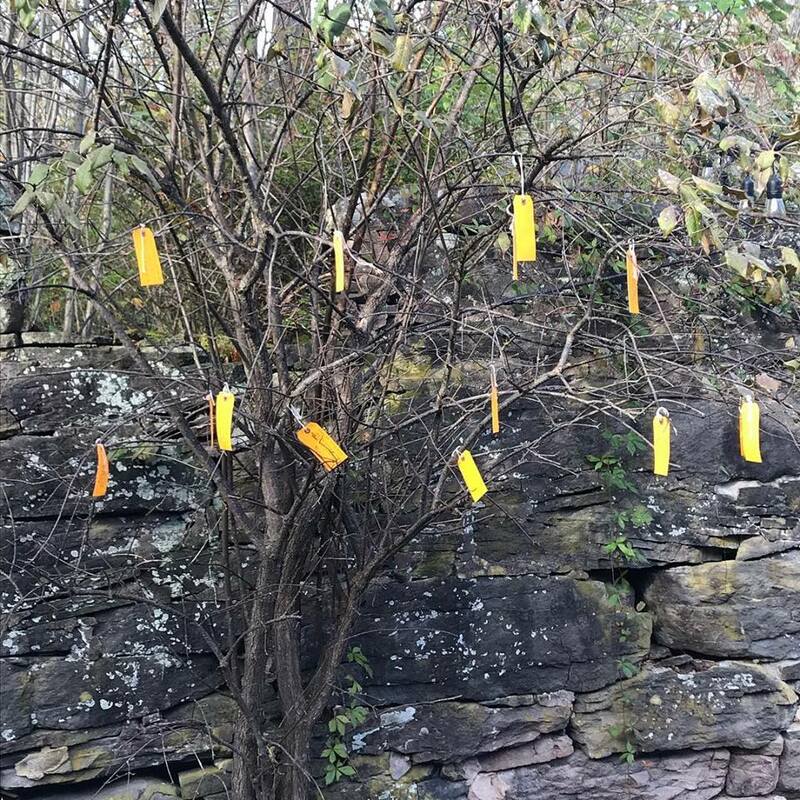 Thoughtful…creative…perhaps a tad unbalanced. 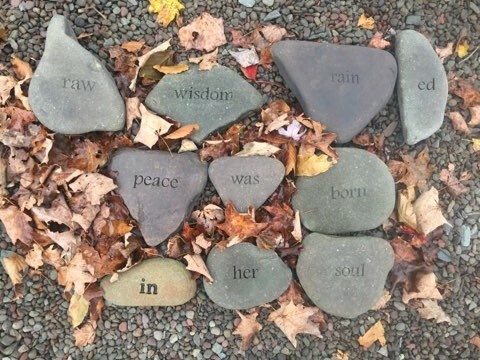 These are a few of the “poems” we discovered when we arrived – but with hundreds of rocks available, we wasted no time creating our own. 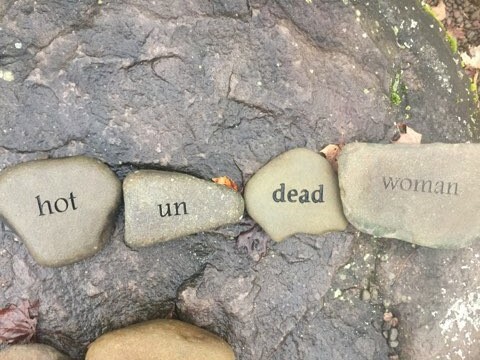 (I’ll share mine in an upcoming Poetry Friday post) And if you’d like to learn more about how you can support The Word Garden, click HERE. S’Mores Night: Ah yes, it just wouldn’t be an October Foundation workshop without a campfire and s’mores. We gathered around a small outdoor fireplace adjacent to the Barn and roasted marshmallows – and I shared my “secret” for grown-up marshmallows: after you place yours on the roasting stick, dip it in a high-alcohol liqueur like Grand Marnier or a spiced rum for 10-15 seconds, then hold it over the flames. It will immediately flare up as the alcohol burns off, and you’re left with the essence of the liqueur on your marshmallow. You’re welcome! 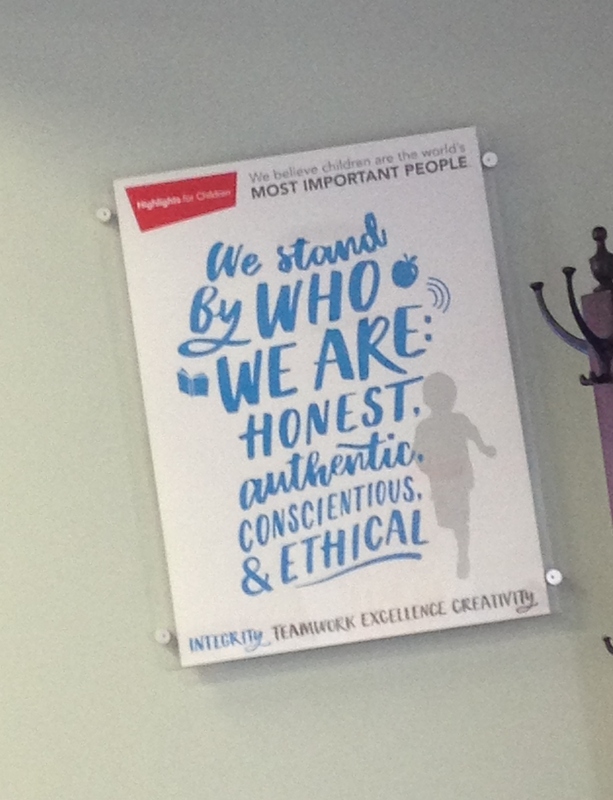 You can’t tell the family members from the employees: I get the impression that everyone who works for Highlights approaches their job as if they are part of a large family – which, in actually, they are…kind of. Many of the grandkids and great-grandkids of the original founders continue their family’s legacy by working there, but even the non-familial employees behave as though they have as much at stake in their job as the owners. Friendly, professional, helpful; honestly, there are giant corporate function facilities that could learn a lot about customer service by watching the Highlights cook and waitstaff serve a meal. A Visit to ‘Highlights’: This was definitely a highlight of the workshop (har, har – there I go again, “highlight!” I crack myself up.) One afternoon, we drove 20 minutes south of The Barn to Honesdale, PA, to visit with the folks who publish ‘Highlights for Children’ and its related publications, as well as book imprints Boyds Mills Press, Wordsong, and Calkins Creek. 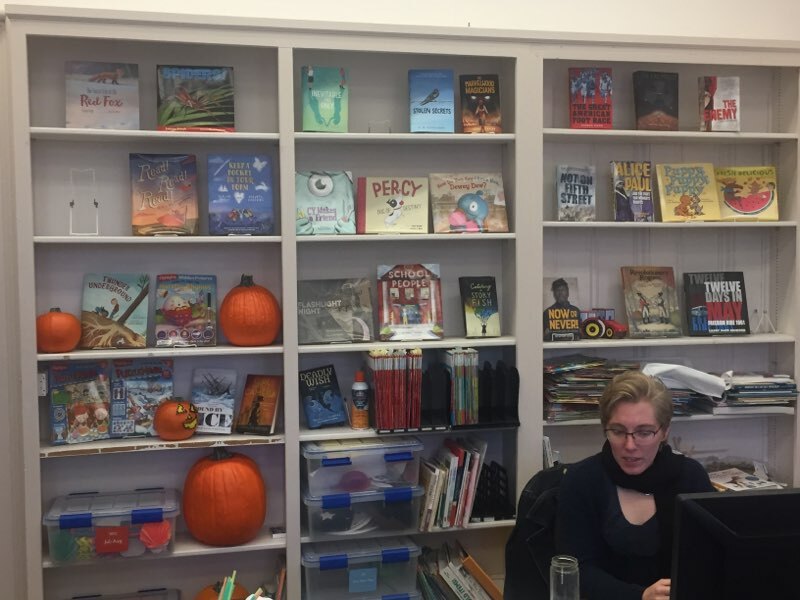 How surreal is it to see one’s book on a bookcase that includes titles by Jane Yolen, Nikki Grimes, David Harrison, and J. Patrick Lewis, among others? Pretty darned, I’ll tell you that. I had not been to the office since my previous workshop in 2013, so I had never before met in-person with people like Allison Kane, who has purchased poems of mine for the magazine, or Cherie Matthews, assistant editor for Boyds Mills Press, with whom I’ve corresponded for nearly 3 years via email. I was deeply honored when one of my fellow attendees, Kerry Cramer, asked if he could get a photo of the two of us. I was so happy he liked my book so much, I didn’t know what else to say but, “sure!” Thanks for your support, Kerry! Cheryl Matthews, who has done as much for ‘Flashlight Night”‘s success as anyone, took time for a quick photo op with one of her fans. 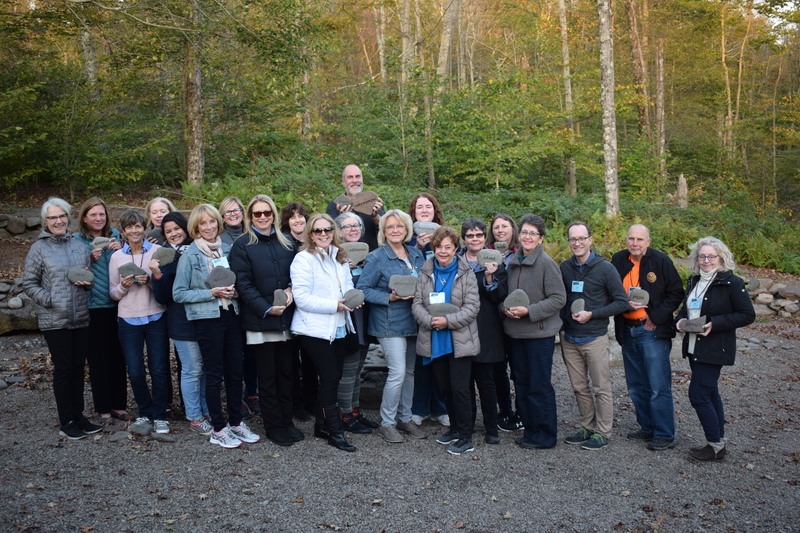 I have to tell you, the Highlights Foundation workshops are unlike any workshops you’ve ever been to. There is the educational component, of course; but what sets these workshops apart from all others is everything that goes along with the education: time allowed for relaxing, meandering, napping, writing, contemplating, snacking. Learn more about the Foundation, their workshops (which range from poetry to novel writing to non-fiction to illustration and everything in-between), and what they do, please visit their website. The workshops are worth every penny, and they even offer scholarships to those who qualify! And if you have any questions about my experiences there, don’t hesitate to ask in the comments or email me! 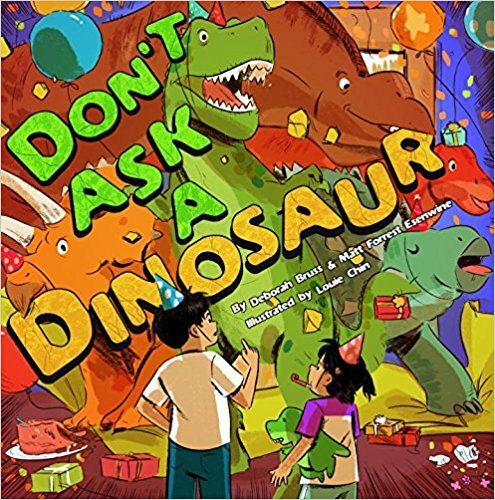 I’m looking forward to spending some time with my DON’T ASK A DINOSAUR co-author, Deborah Bruss, this Sunday afternoon in Warner, NH to celebrate the Book Birthday of her new book, GOOD MORNING, SNOWPLOW! We’ll both be there signing our books, including DINOSAUR, FLASHLIGHT NIGHT, SCHOOL PEOPLE, and the new National Geographic book, THE POETRY OF US. Hope you’ll join us, if you’re in the area! Details here! It’s hard to believe, but summer is coming to an end and kids are heading back to school. I know some folks whose kids have already started, but the first day for my two is next Tuesday…so I thought a little excerpt from Lee Bennett Hopkins’ School People (Wordsong, 2018) would be apropos! 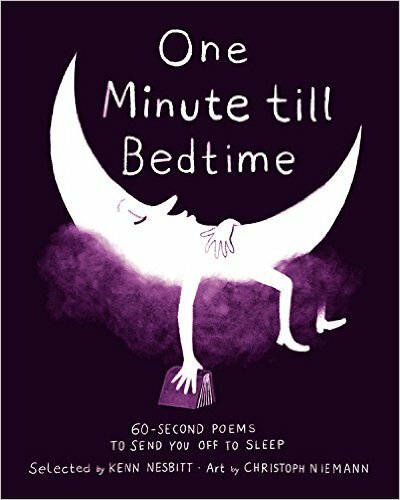 Edited by my Flashlight Night editor Rebecca Davis, the book includes 15 poems about all the grown-ups that children meet at school, like the Teachers, the Crossing Guard, the Librarian, the Nurse – and of course, the person who transports the kids from home to school and back again, the Bus Driver! It’s a beautiful book, so I hope you’ll consider picking up a copy. 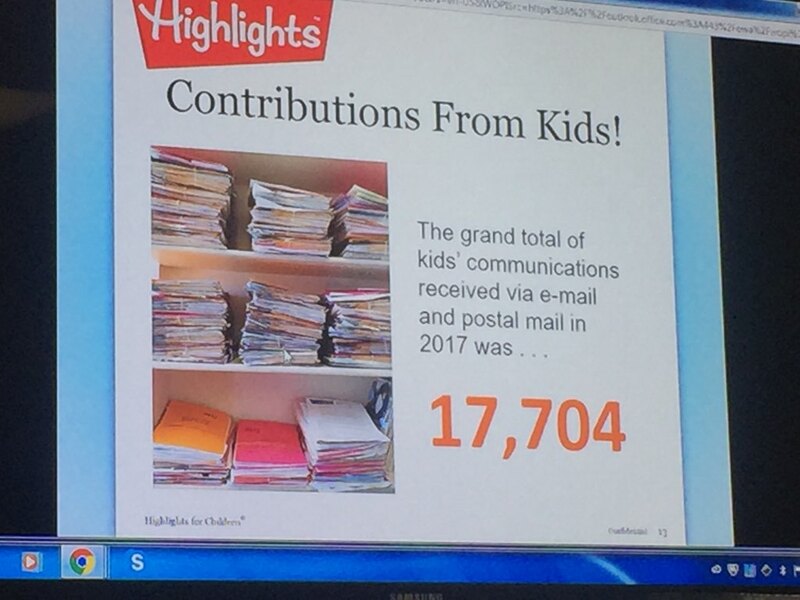 In fact, the local Rotary Club recently purchased 15 copies to distribute to each of the kindergartens in our district, as part of their literacy program! For more poetry, head on over to Reflections on the Teche, where Margaret is hosting the Poetry Friday roundup with a zeno! And by the way, if you’re a teacher, I hope your Classroom Book A Day list includes a wide diversity of books featuring authors & illustrators from all walks of life. Because your students come from all walks of life! Whether it’s silly or serious, poetic or prosaic…whether the characters are white, black, male, female, straight or otherwise…no matter who it was written by…keep in mind that students not only see themselves in the stories, they often look for themselves in the creators. Please help them find what they are searching for! 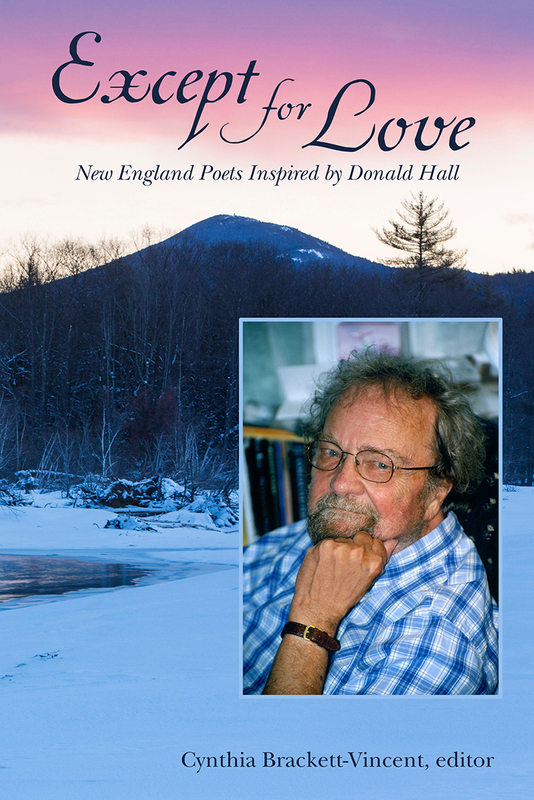 Poetry Friday: “Epitaph for a Mayfly,” a new poetry cover reveal, and a BOOK WINNER! 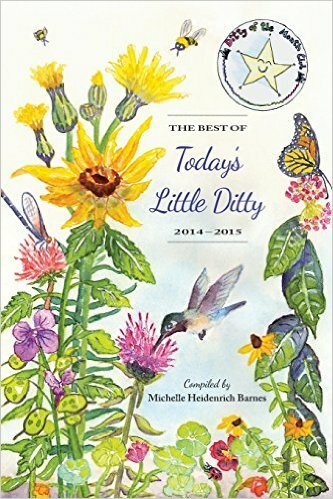 My friend and fellow writer/blogger Michelle H. Barnes has once again been hosting her Ditty of the Month Challenge, where she encourages readers to contribute poems prompted by her various blog guests. This month, she’s featuring J. Patrick Lewis and Jane Yolen, whose brand-new book Last Laughs: Prehistoric Epitaphs (Charlesbridge) is both hilarious and often surprisingly touching. Click here to purchase a copy of Michelle’s latest anthology, personally signed by a guy named Matt. set off for a swarm seduction. Lost his mate; could not locate her. Sadly, died a few hours later. Indeed, those short, one-day lifespans are a real bummer. What’s NOT a bummer? End-of-year lists! 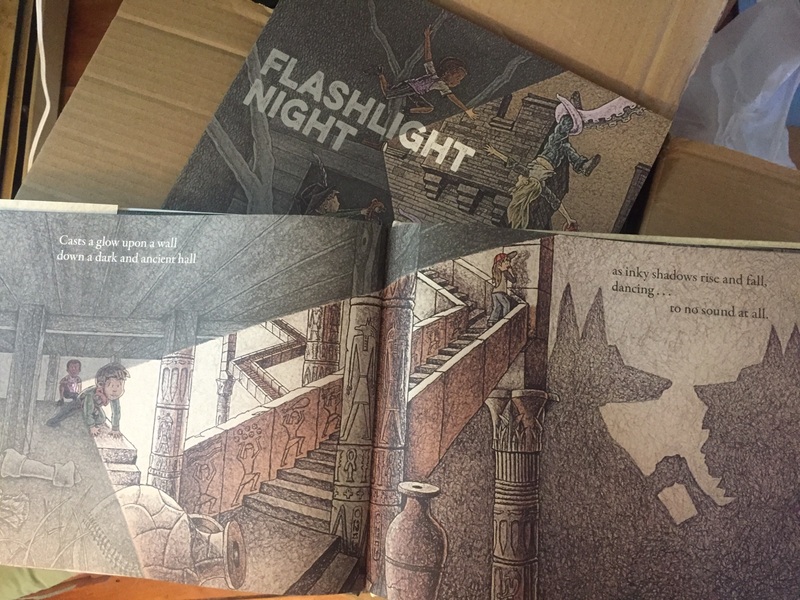 I was thrilled last month when I learned that Flashlight Night (Boyds Mills Press, 2017) had been selected by the New York Public Library as one of the 100 Best Books for Kids of 2017…and now it’s a children’s book NYPL Staff Pick! I cannot believe that a book of mine is included with books from authors like Jane Yolen, Nikki Grimes, Mac Barnett, and others. 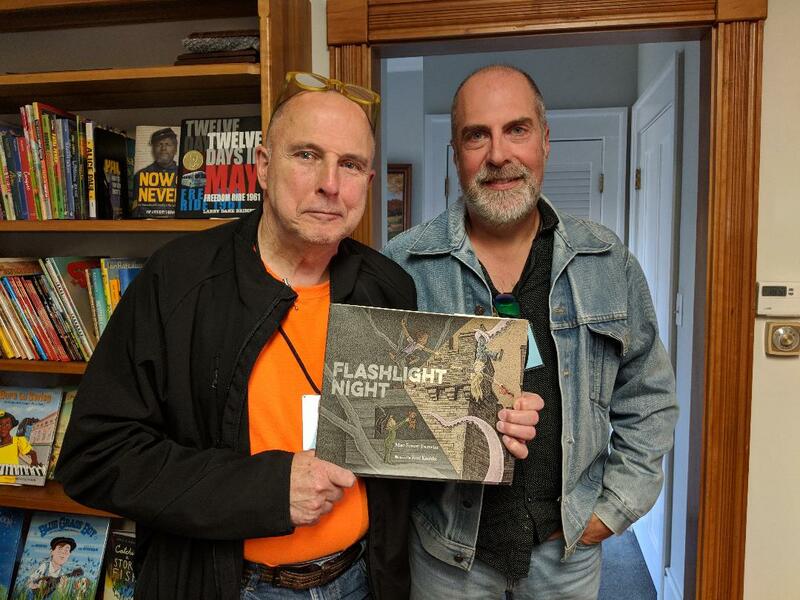 My thanks to illustrator extraordinaire Fred Koehler, editor Rebecca Davis, and the entire crew at Boyds Mills Press for their hard work and support! This has always been a group effort from the very start, and I’m proud to have been a part of it. The fact that my very first picture book was published by the “Highlights” magazine family will always be special to me. We have yet another cover to another poetry anthology! 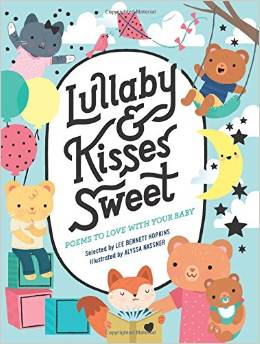 I’m excited about this book not only because I have a poem included, but because – unlike National Geographic’s previous poetry anthologies – was designed as an “all-ages” book. 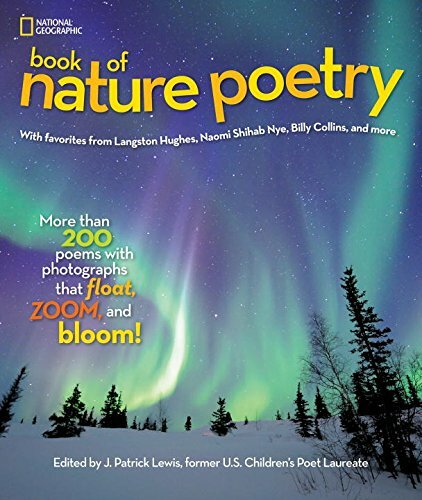 The first two, The National Geographic Book of Animal Poetry (2012) and The National Geographic Book of Nature Poetry (2015), were geared more for school-age children, while this new book contains poems that will be appreciated by grown-ups as well! 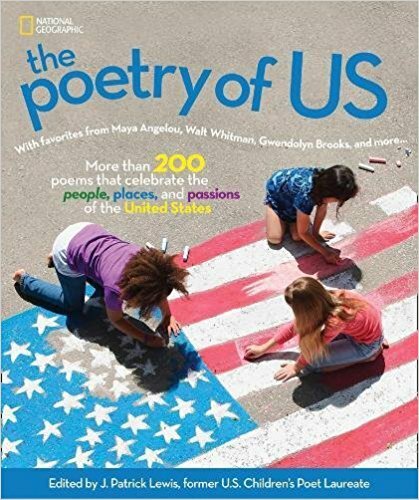 Edited by former U.S. Children’s Poet Laureate J. Patrick Lewis, this book is a veritable Who’s Who of classic and contemporary poets, featuring poems and photos of people and places of the United States of America: the bustling cities, the out-of-the-way towns, the people, the monuments, the substance of what we call Americana. My poem, for example, is a blank verse sonnet about the Stratosphere Casino, Hotel, and Tower – one of Las Vegas’ famous (and highest) landmarks. And I can’t wait til it comes out! 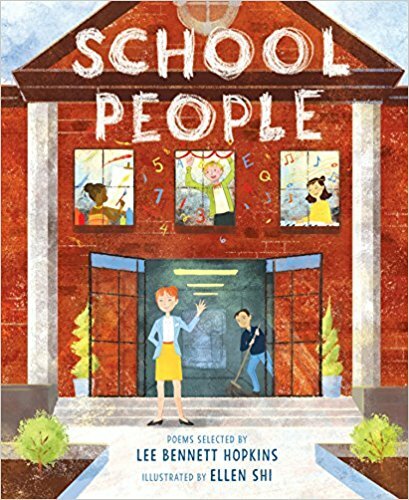 If you visited my blog last Friday, you had the opportunity to learn a little bit more about Lee Bennett Hopkins and how he creates his anthologies…and you also had multiple chances to win a copy of his newest book, School People (Wordsong)! 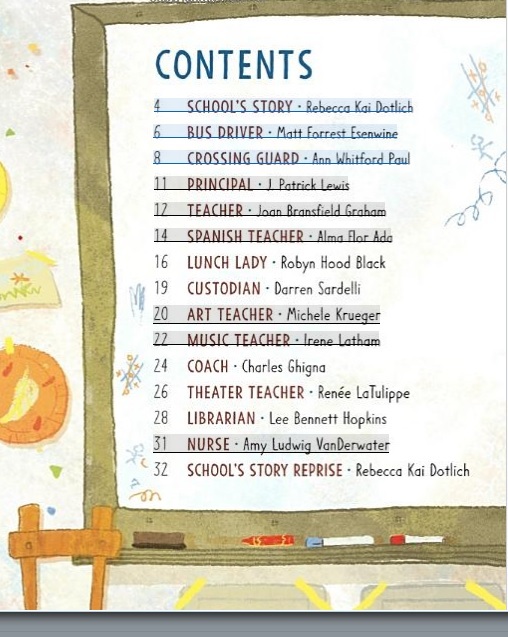 This book includes 15 poems about the grown-ups that children meet at school, like the Teacher, the Lunch Lady, the Librarian, the Custodian…and the “Bus Driver,” written by Yours Truly. Congratulations, Bob – and thank you for your support of what I’ve been doing these past several years. Thank you also to everyone who commented and shared last Friday’s post…I had more entries than any other contest I’ve done here! 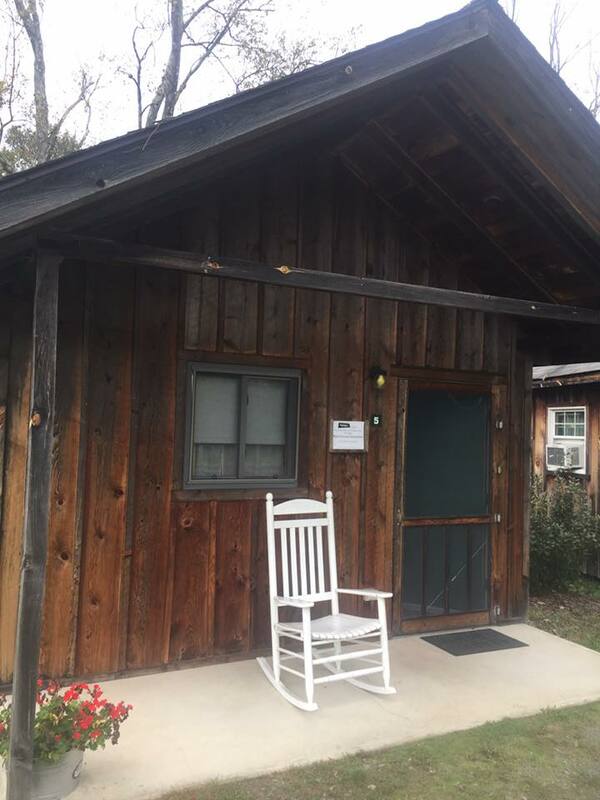 There’s more poetry ahead, folks – for today’s complete Poetry Friday roundup, head on over to Liz Steinglass‘ little home on the web and check out all the links and fun! MORE DATES to be added! 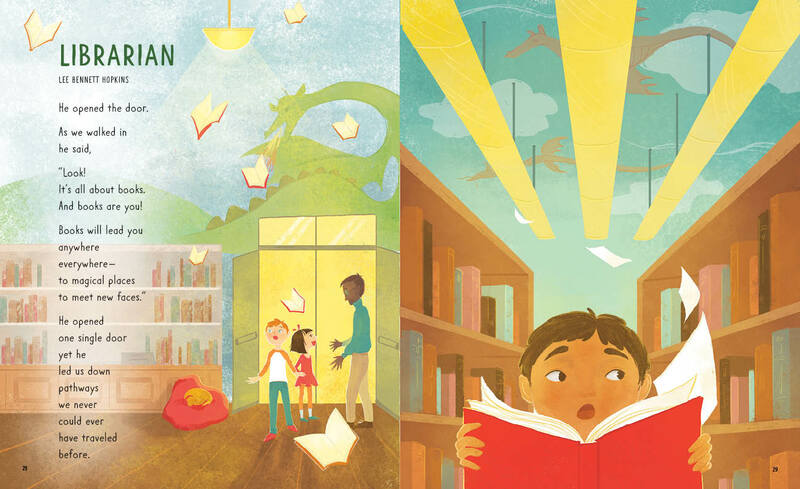 School People (Wordsong), Lee Bennett Hopkins’ new children’s poetry anthology, is officially in stores! 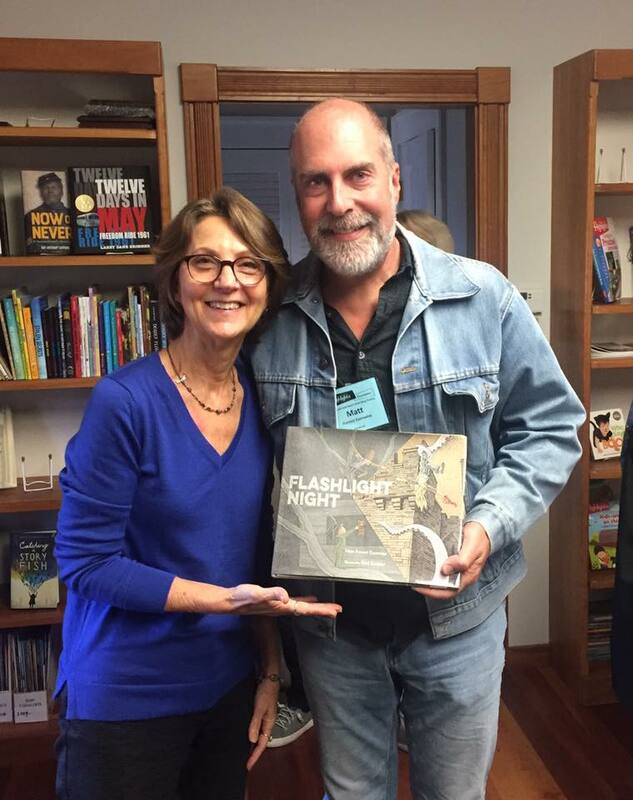 Edited by Flashlight Night editor Rebecca Davis, this book includes 15 poems about the grown-ups that children meet at school – including my poem, “Bus Driver.” Today, Lee Bennett Hopkins joins me for a brief interview about the book and how he goes about creating these exceptional anthologies. First of all, Lee, I want to thank you for asking me to contribute a poem to another one of your books! I know I speak for all of the contributors when I say that is always an honor when asked to write something for a Lee Bennett Hopkins anthology. What was your first anthology, and how did it come about? After teaching for six years in an elementary school in Fair Lawn, New Jersey, and having completed my Master’s Degree at Bank Street College of Education (when Bank Street College was on Bank Street in Greenwich Village), I was offered a job working with Bank Street to develop new programs in Harlem where I wrote numerous articles, many dealing with African American studies. My work was with junior high school students and teachers to bring African American literature and poetry to weave into curricula. Born in Scranton, PA, Hopkins graduated Kean University, Bank Street College of Education, and holds a Professional Diploma in Educational Supervision and Administration from Hunter College. He received an honorary Doctor of Laws degree from Kean University, the University of Southern Mississippi Medallion for “outstanding contributions to the field of children’s literature,” and a place in the Guinness Book of World Records for his 120+ children’s poetry anthologies. He also received the National Council of Teachers of English (NCTE) Excellence in Poetry for Children award and the Florida Libraries’ Lifetime Achievement Award. On May 22, 1967, Langston Hughes died in Harlem; a few blocks away from where I was working. I wanted to share more of his work. The only book he had done for children was The Dream Keeper and Other Poems (Knopf) published in 1932. 1932! Although the words were as universal as ever, the artwork was stereotypically appalling. I could not share an Aunt Jemima-looking woman in her bandana nor a tap dancing-like dude with cap and cane with students or colleagues. I brazenly called the Knopf office and asked to speak to their current editor. Imagine this! I was young, naïve – and truly didn’t know better! After asking why a new book of Hughes poems had not been published and angry over the artwork, the editor, Virginia Fowler, stopped me mid-ranting and asked me to meet her for lunch. She remained shocked I had the nerve to call her but told me how she loved my enthusiasm. Voila, I was offered a contract to bring a new edition of Hughes work to life. The result Don’t You Turn Back, with exquisite woodcuts by Ann Grifalconi. The book was highly touted, won numerous awards including an ALA Notable Book. The Introduction was written by Arna Bontemps, noted author, historian, and friend of Hughes. I was truly on my way; the first of many books I published with Knopf! 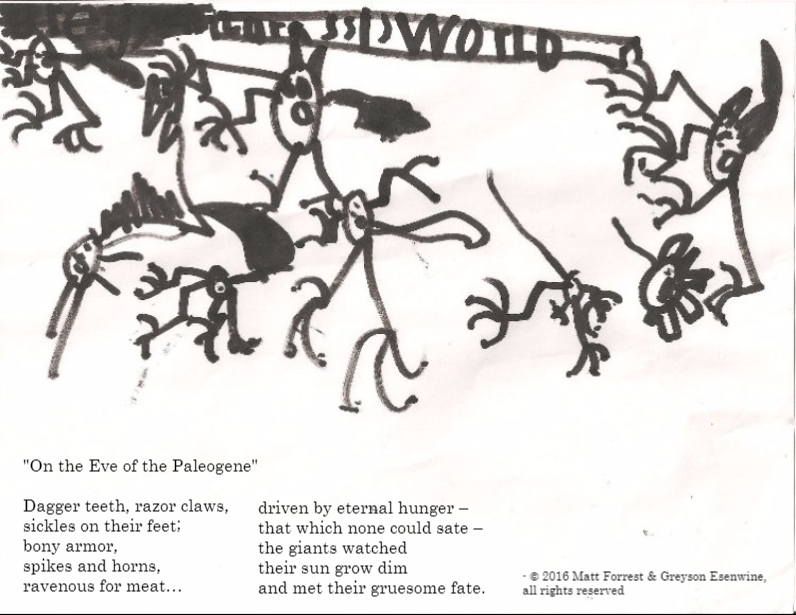 These days, there are poetry collections about everything from food to bugs to historical events. How difficult is it to come up with thematic concepts that will not only be commercially successful, but of a high literary value, as well? The “high literary value” comes via the pens of today’s poets, established voices and well as newer ones. It is the culmination of hours, days, months, sometimes even years of back-and-forth-ing, editing, rewrites galore, the supreme delight of working with disciplined poets. How lucky I am to have them in my life. Can you provide us with some insight as to how an anthology comes together? That is, once a subject is determined and the publishing contract is signed, what happens next? I make a list of poets I would like to invite. Knowing their work I have the gut feeling of what they will create. Many have appeared in past collections. I know, for example, that Joan Bransfield Graham writes with emotion which gives me goose bumps. I sigh after she is finished with a poem. It is remarkable the empathy she can bring to a few lines. I also want to take chances with ‘newer’ poets to help them advance their careers. Once all the poems are in they are sent to an editor. In this case, Rebecca M. Davis at Wordsong/Boyds Mills Press. Rebecca and I have worked on countless collections. Not only is she my dearest friend, she is among the best editors in the industry. We sort of know where to go. If I go astray she’ll lead me right back on track. She is my Poetry Mistress! (Smile, Rebecca!) I can’t wait to begin a collection under her keen guidance. Last year, you were inducted into the Florida Artists Hall of Fame along with such highly esteemed folks as guitarist Don Felder of the Eagles and country signers Billy Dean and Jim Stafford. I know you were very surprised when it was first announced…but how did it feel to actually be there, accepting the award? The Award Ceremony was held in Gainsville, Florida. It was a mind-boggling gala to be in a room filled with such creative people. A host of people were instrumental to my induction including the tireless, determined work of Jude Mandel and Stephanie Salkin. My greatest shock and delight was to appear on a roster of people such as Ernest Hemingway, Zora Neale Hurston and my all-time idol, Tennessee Williams. I shall forever be on A Streetcar Named Desire due to this honor! 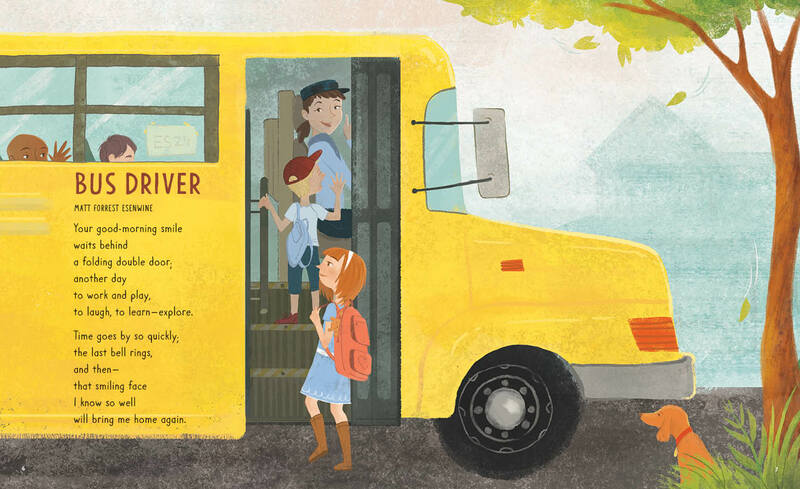 Finally, since this new book, School People, is all about the grown-ups that children meet when they go to school…who was your favorite “school person” when you were in elementary school? Oh, and I would be remiss if I neglected to ask what is next on your publishing schedule! I know you have a couple of other anthologies coming out next year; any more books this year? I am looking forward to the release next month of World Make Way: New Poems Inspired by Art from the Metropolitan Museum of Art (Abrams). World Make Way is visually stunning, highlighting masterpieces by artists as Mary Cassatt and Henri Rousseau to the contemporary Kerry James Marshall. The poetry is ekphrastic verse featuring all new works by such award-winning poets as Guadalupe Garcia McCall, Marilyn Nelson, Naomi Shihab Nye, and Carole Boston Weatherford. In the fall, a romp of a collection, A Bunch of Punctuation (Wordsong/Boyds Mills Press) bringing punctuation marks to riotous adventures. O! what some of my wondrous poet friends have come up with including odes to a dash, a hyphen and parentheses! Well, thank you again, Lee, for taking the time to chat – and thank you also for inviting me to be part of School People and some of your other upcoming books. Congratulations on this newest accomplishment! Thank you, Matt, for all you do to promote poetry. Speaking of poetry, folks…if you head on over to Ms. Mac’s place, Check It Out, you’ll find today’s complete Poetry Friday roundup! 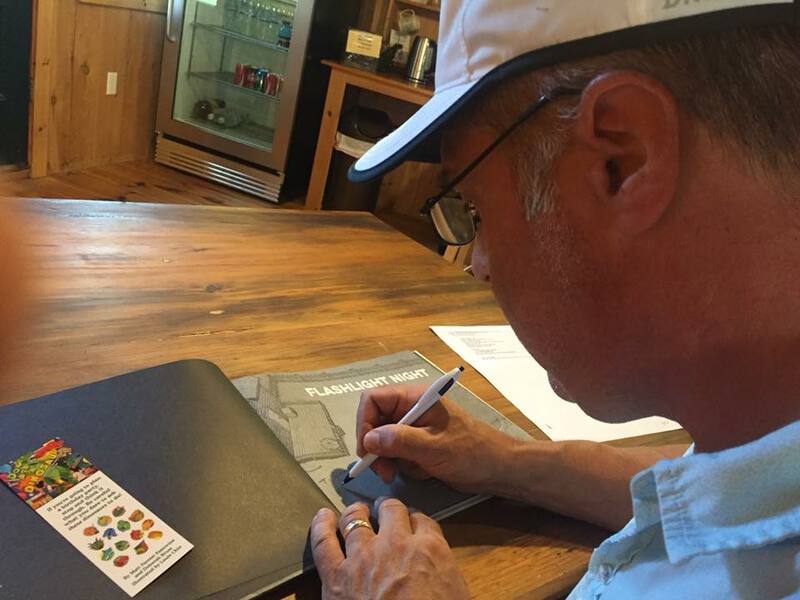 If you’d like to order a copy of “School People” personally signed by Yours Truly, just CLICK HERE! I’LL PICK ONE NAME AT RANDOM NEXT THURSDAY NIGHT AT 8PM EST AND ANNOUNCE THE WINNER IN NEXT FRIDAY’S BLOG!